2 people having 2 non-alcoholic drinks, 2 entrees, and often one dessert to split. one star indicating we won't be back so be seated at your own risk. 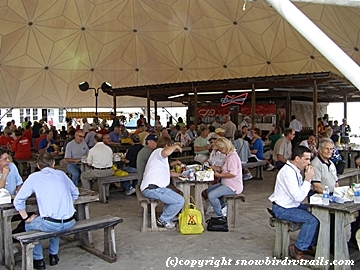 We love to dine out wherever we happen to be camping. 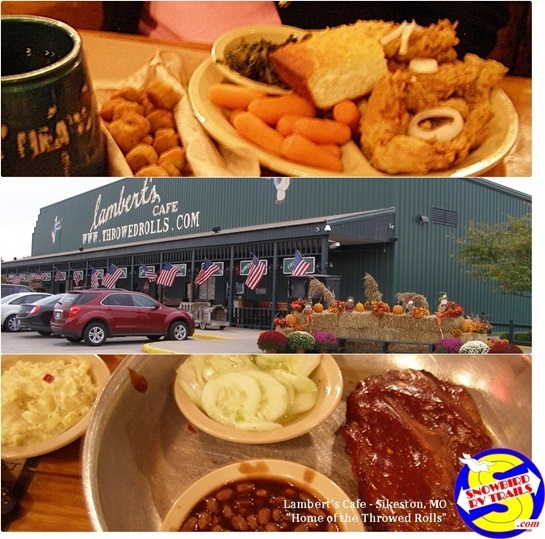 Always looking for those great local and family owned "Mom & Pop" restaurants. It's part of seeing what the local area and its people are all about. Some great and not so great experiences. We tell it like we find it and these are strictly our opinions of each experience at the time we paid the checks. Good little BQ joint that we have heard is now closed? Slow service, so-so food, and expensive for the privilege of being ignored. We'll not be back. Like any franchise, the food is pretty much the same but the help make the difference in a good or bad experience. Reliable food and good service at this Bob Evans. Lunch at “The Rah Bar”on the wharf at the Jekyll Island Club. Sitting on the dock of the bay was a real treat. 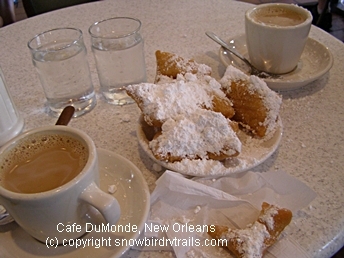 We both had the shrimp salad croissants which were very good. We ordered a slice of “homemade” key lime pie to share but returned it after deciding it had no relation whatsoever to any key lime pie that we know and love. 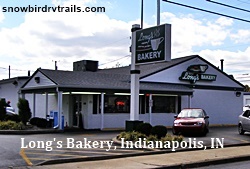 for road weary travelers looking for a smile, a pleasant atmosphere and reliable food. This one is just off I-75, Georgia Exit 135. Just look for all of the Cadillacs and seasoned citizens and you’ll be there. 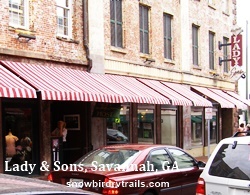 early home downtown but the food we tried did not live up to their “Famous for home-cooking and Southern charm”. Maybe we caught them on a bad day? your campground! Such is the case with this store within walking distance of the Chattanooga Holiday Trav-L-Park we stopped at in Rossville, GA. Not great for our diets but our taste-buds didn’t complain. Always very busy which says a lot! Over 200 items to choose from so it's much more than just cheesecake though the cheesecake will make you want to come back. Expensive maybe but you are getting what you are paying for. Tucked in a strip mall. Offers a daily buffet, full menu service, carry out, delivery or catering. It has very good food and an attentive staff. We have visited Golden Corral's all around the Country. Some good, some bad. This is definitely one of the good ones. 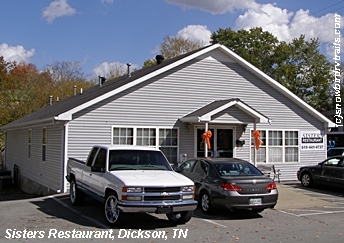 The place was clean, the service attentive, and the food was hot, tasty and well presented. 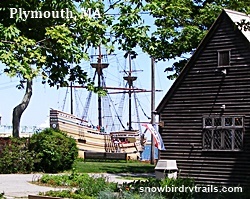 In fact we went here twice on a recent visit and we left happy both times. complained and the replacements were no better. We won't be back. from place to place and do tell it like we find it. 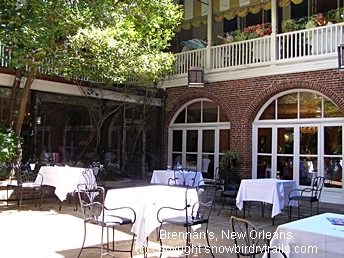 Service and food here are both good.The Bob EvansClub emails coupons good at all of their restaurants. Food was just average and probably not a good value based on the price. They do have an afternoon Senior Discount. there our servings were huge, prepared well and served hot. Our waitress was friendly and attentive. Probably is the best Mexican restaurant in the area. miss an opportunity to stop by one of their shops. The Colonel knew what he was doing and it has endured. You either like it or not but you can pretty much count on the same taste from those secret recipes at every store. This appears to be a clean KFC and the help is cheerful and friendly. They shoot for the flavor of down-home Southern cooking but their aim is faulty. We thought the overuse of salt to give the dishes some flavor really shows that the cook can’t! You’re probably better off with the KFC just up the road. Attached to L.L. Bean. Log cabin atmosphere. Specialty soups, sandwiches and wraps. Expensive and not really filling or satisfying. Pretty decent Italian food for non-Italian owners. Pleasant atmosphere. We felt it a little pricey but the food was good. 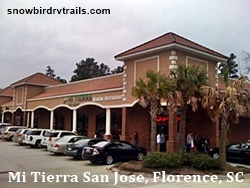 Not many restaurants to choose from in Greensboro so we took a chance and found that this place makes pizzas and Italian dishes that are very good and a local favorite. Put simply, Seafood Bisque and Lobster Rolls to die for! 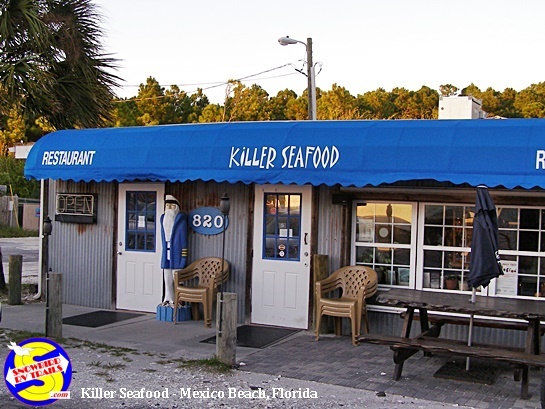 Friendly courteous service and the freshest seafood. Across the Blvd from the waterfront near the Bay Bridge. 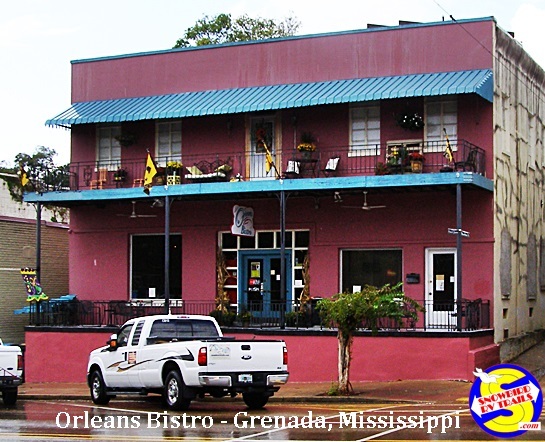 Great view, nicely renovated and an extensive menu, poboys, sandwiches and all types of seafood. The chef runs hot and cold on his dishes, Hopefully you'll be lucky. This area was totally devastated by the hurricanes of recent years but they are coming back strong! Take the Beach Blvd South towards the Casino to see the depth of the destruction. West on I-10 along the Gulf. Why? 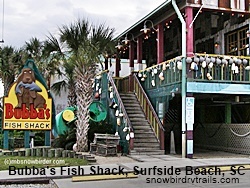 It's in a quiet area, on a Gulf beach, and one of our favorite campgrounds is nearby, Bay HideAWay. 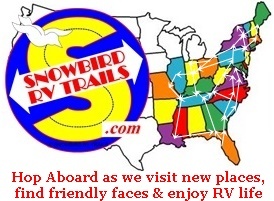 The Casino has a 35 pad RV Park right on the Gulf nearby and they do take reservations. 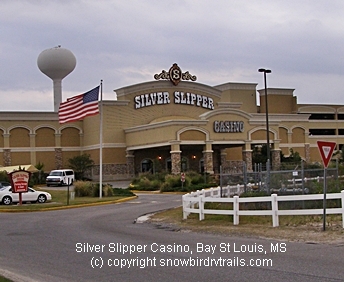 On our last few visits we found the Casino also has offered a reduced rate buffet day for Seniors. A great location - we come for the buffet and stay to play a few slots. Excellent burgers and steaks at reasonable prices. make a great sub. 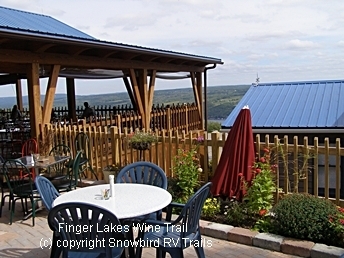 The campground is also the best we have found in the area. Good, cheap, lunch buffet but dinner is not a great value. One of the best Chinese buffets we have ever visited. In fact we stayed 2 nights in the area and had dinner here both nights. As with any buffet, the bigger the crowd the fresher the food. e thought would be canned or frozen, thrown together and nuked for our dining pleasure. Guess what? We found both the service and the food to be top notch and the prices reasonable. If you are a fan of the old fashioned tomato pie pizza you will be happy to know it’s alive and well in Galloway. 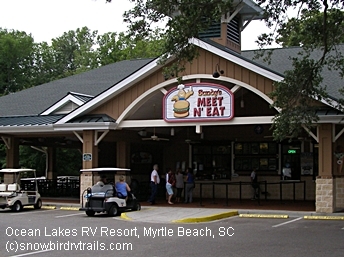 This place was recommended by our campground host and we thoroughly enjoyed the food. 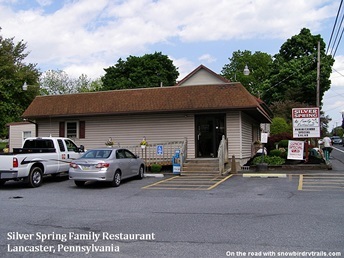 Best home-made ice cream and water ice in the area. Many flavors to choose from. If you’re in the mood you might also want to order an apple, pumpkin, Ginger Snap Molasses, or Harvest Moon ice cream pie! 7 miles from Zooland Family Campground. 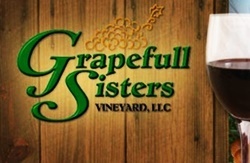 They offer daily lunch and dinner specials. All come with soup or salad and dessert. We both chose the daily special which was Chicken Primavera. The plates came piled high with fettuccine in an Alfredo sauce with tender chunks of chicken and several vegetables mixed in. It was very good and more than enough to bring the excess home for another meal. of the better meals we have had on this trip. Good daily specials. Steak, BBQ, seafood baskets & platters. Friendly service and the food is prepared well. 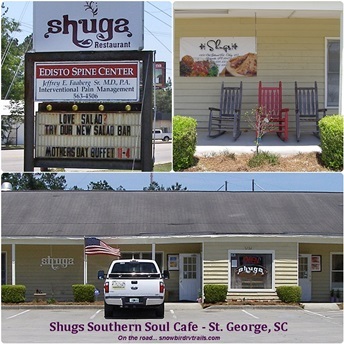 143 Us Highway 158 W, Camden, NC 27921(252) 338-0081 it by, but once you’re inside the food and service more than make up the difference. 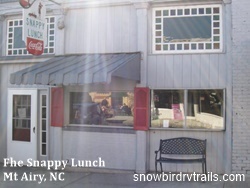 Definitely one of our best meals in NC.Daily Lunch Specials like Homemade BBQ & Cheddar with Fries, Pork Roast, Livers & Gizzards, and Marinated Grilled Chicken Breast with Teriyaki Sauce. Dinner specials as well. 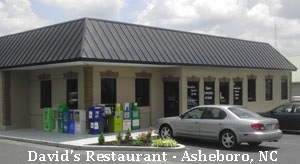 123 Scenic Outlet Ln, Mount Airy, NC 27030 336-352-4108 ice cream. The food and the service did not add up to good value for the price. Skip it, there are many other restaurants locally to choose from. 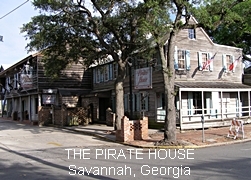 520 S Front St, New Bern, NC 28562 (252) 638-2280 and the hush puppies were great. 256 Middle Street, New Bern, NC 28560 252-636-5898 and Pepsi souvenirs and memorabilia. 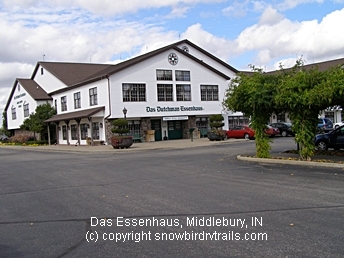 720 Ohio 97, Bellville, OH 44813 have the “Country Breakfast Buffet” from 7-11am everyday..
57 E Under Ridge Rd, Conneaut, OH 44030 a lunch or dinner break, this is the place. It’s just off the exit and on the hill across from the Love’s Truckstop. 618 Ohio 61, Marengo, OH 43334 is just so-so. Their aim is for Amish/PA Dutch type homecooking but they are a little off target. 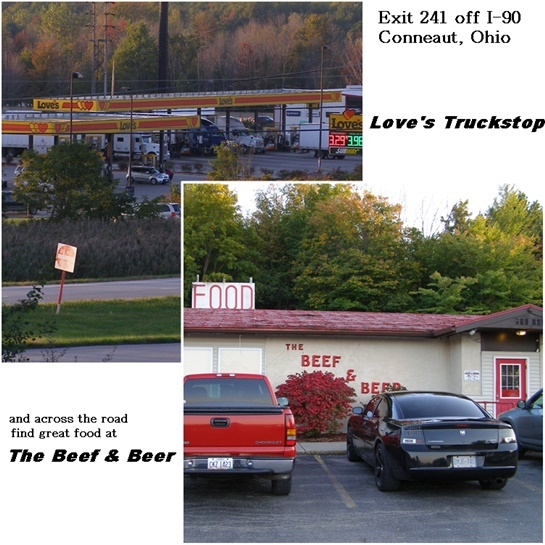 3 locations in Zanesville. We like Bob Evans as a rule and tend to seek them out whenever we are staying nearby. 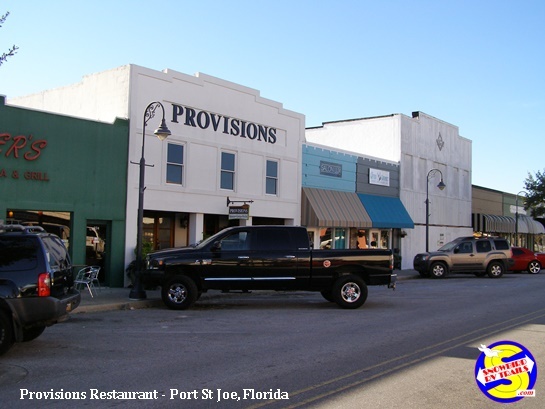 The food is predictable and likable but the service varies greatly from place to place. This is one of the good places. Join the BE Club and receive coupons emailed often. Great selection, so plenty to choose from. Typical Chinese buffet but larger. Try to snag a local BOGO coupon. We found some good home cooking and PA Dutch classics like Chicken Corn Rivel, Baked Tomato Crock, French Onion Crock. Along with the usual salads, burgers and sandwiches. It is pricey. Order only one but with 2 spoons. It’s just that big, as Jack soon found out. 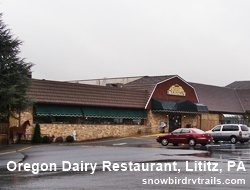 2900 Oregon Pike, Lititz, PA 17543 (717) 656-2856 with many contemporary favorites. Featuring two private dining rooms, The Parlor and The Meadows�. Nice atmosphere and good food. Our last dinner in Myrtle Beach is usually at Angelo’s, another favorite of ours. It’s a favorite for golfers as well; after a day of chasing the little white ball nothing beats a really good steak and Angelo’s serves close to 100,000 of them each year! 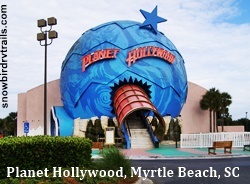 It' a favorite with us whenever we are in Myrtle Beach. 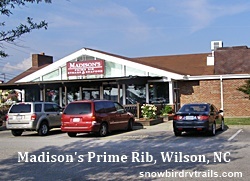 Great steaks, good service, and a small but delicious Italian buffet served cafeteria style. A fun, family place with pretty good pizza. We are told it is now closed. Great burger plates cooked and dressed to your specs. Feel a little wild? Try Buffalo, Elk, Wild Boar or Ostrich burgers. What else can we say? They do make a tasty burger. 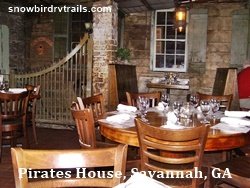 Good prices and a wide choice of well prepared Low Country dishes. Courteous service, clean, comfortable atmosphere. 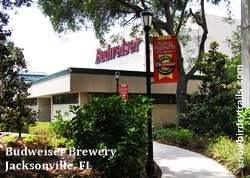 We always enjoy a visit. We took our local friends’, Patrish and Wally’s, suggestion to have dinner at Maggi D’s Italian Restaurant near the Coastal Grand Mall in Myrtle Beach. Exceptional service cheerfully prodded on by the jovial owner. We enjoyed the Chicken French and the Spaghetti & Meatballs. A piece of lemon cake for dessert topped off the meal nicely. 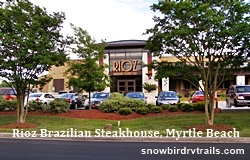 Rioz Brazilian Steakhouse (5/14 $66.14)*** took Niki out to the Rioz Brazilian Steakhouse in Myrtle Beach. Neither of us is a big meat eater so we had just the salad bar which offers some 35 items that you don’t normally find on an average salad bar. The atmosphere is noisy and chaotic but we both enjoyed our meal. “The Kids” treat was thoroughly enjoyed by the two of us. the endless variety of carved meats delivered table side make it a dining "happening". stop when we are on this route again. 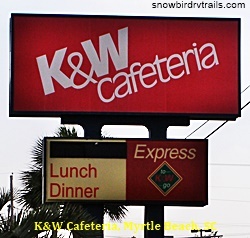 It was our favorite Chinese in the Myrtle Beach area at one time. 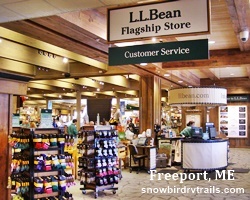 Clean, bright, airy, with a great selection and a good price. Perhaps it is under new ownership but the food quality has slipped. Pretty good seafood but not sure if the quality matches the price. Delicious Mexican food prepared properly and served in a friendly family atmosphere. Thursday turkey and dressing day. Ahh, a new favorite Greek/Italian place to add to our list. Niki had the Chicken Florentine and Jack had the Spaghetti Portofino. The food and the service were superb. People do drive from miles to come to this restaurant. 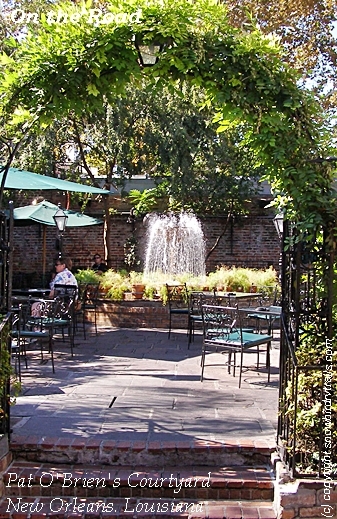 It’s a favorite spot for locals to celebrate birthdays and other special events. It’s also very close by Exit 1 off I-75 in Tennessee. Just off I-40, Exit 143 and high on a hill. $10 buffet or order from the menu. Simple down-home Southern fare, some items fresh made some from a can. Of course there's a LL gift shop as well. us. We would give this place one star but for the food had great taste - if it wasn't served cold. Just our opinion. RED PEPPERS AND CHEDDAR CHEESE, THINLY SLICED RARE ROAST BEEF (VERMONT FAMILY FARM) WITH BOURSIN CHEESE SPREAD, LETTUCE AND RED ONION. Be sure to save room for one of their unique, mouth-watering desserts made fresh daily..
We last stopped here in 2014 and had a 3-Star, 3-course chopped sirloin dinner. The sirloin was overcooked but otherwise a tasty lunch. This time we "splurged" on the 3-course lobster special ($17.95) - a mistake. Our waiter was lax, inattentive, unfriendly and probably in the wrong profession - an "It's just a job!" attitude. The shrimp was rubbery - the lobster moreso - to the point of being difficult to cut. The stuffing over-seasoned. My drink was not served until after the salad course. No coffee refill until the end of the meal. The manager apologized and did not charge for one meal. Overall a very bad experience and we will find a better establishment when next in Rutland. it not a good value for the price. 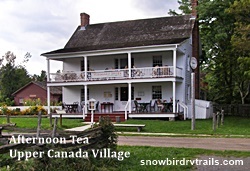 Folks travel from miles around for limited seating but very good home-cooked foods, soups and salad plates. 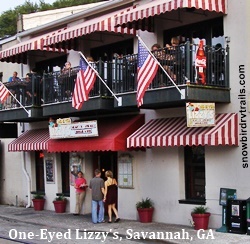 A favorite place with locals and tourists alike. Where you can often find local farming couples discussing weather and crops with their neighbors. 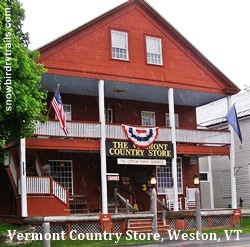 Stands beside the Vermont Country Store. Country home refurbished as a restaurant. Inattentive service and not the quality of food one would expect for the price. Our visit was at lunchtime. AApplebee’s has good food as a rule and though a little on the expensive side our opinion usually comes down to the service received. On this day we found the service slow and unattentive but if you are an Applebee’s food fan you probably will enjoy your visit here. The food was average at best. We didn’t see many locals eating there which usually tells us a lot. We won’t be going back. us several times even after the wait staff came on duty. To say the food is even better than the service would not be an exaggeration! 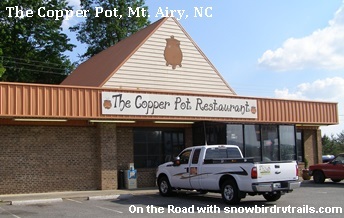 One of our favorite dining spots in Virginia on the road. Try it and we think you’ll like it. it is rather pricey. Again, we don’t complain about price if the food quality and service merit it. This place is not a good value. 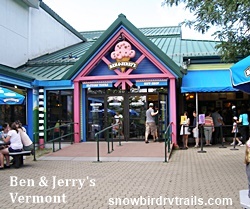 However we do recommend a frozen custard stand also in New Market on US-211 just as you start out of town toward the Blue Ridge Parkway. 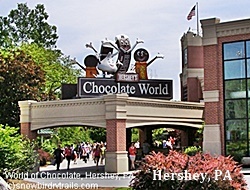 They have a hot fudge brownie creation that you won’t soon forget!